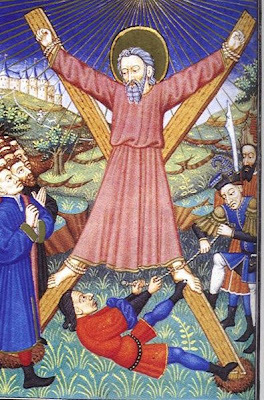 Here is an old prayer which if meditated upon daily from the feast of St. Andrew until Christmas Eve is said to be instrumental in bringing many graces. 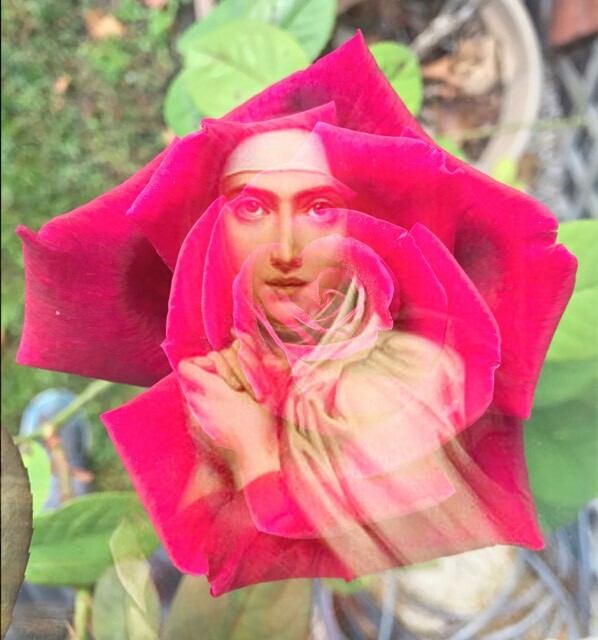 An old Italian nun once told me it was supposed to be pondered fifteen times a day, rather like the prayer of the rosary, so that the soul comes to taste the meaning of the words, and enter into the ineffable mystery. 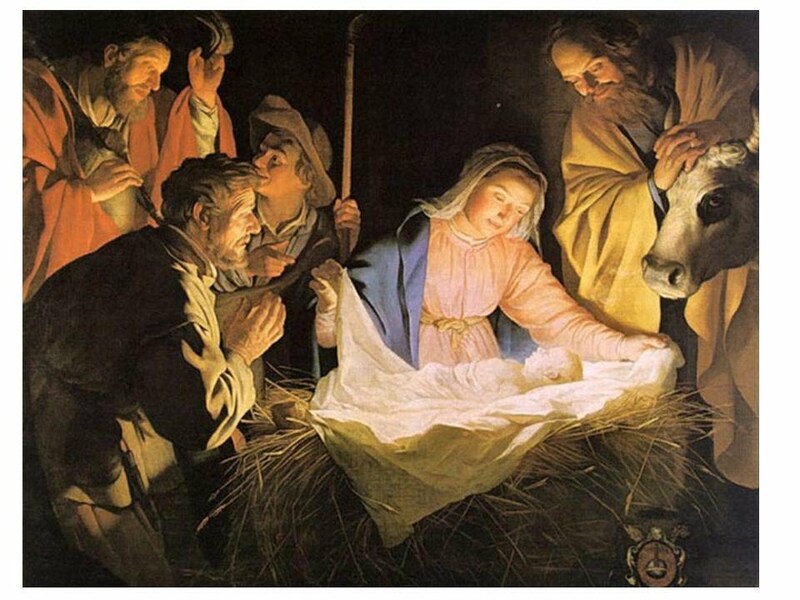 Hail and blessed be the hour and the moment when Jesus Christ was born of the pure Virgin Mary at midnight in Bethlehem in piercing cold. At that hour vouchsafe O my God to hear my prayer and grant my petition through the intercession of Jesus Christ and the Virgin Mary His Mother. Amen. 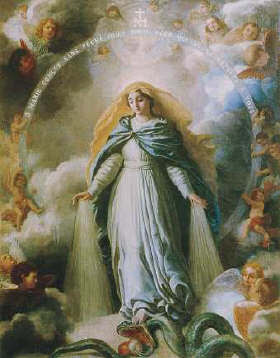 Holy Mary, Mother of God, I firmly believe in thy Immaculate Conception. I bless God for having granted thee this glorious privilege. I thank Him a thousand times for having taught it to me by the infallible voice of the Church. 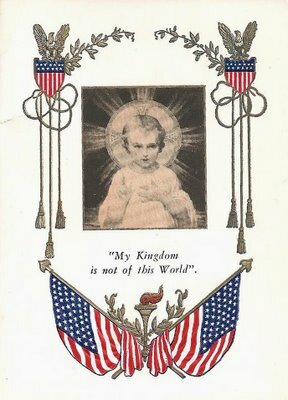 Receive my heart, O Immaculate Virgin; I give it to thee without reserve; purify it; guard it; never give it back to me, preserve it in thy love and in the love of Jesus during time and eternity. AMEN. V. Thy name, O Mary, is as oil poured out. R. Thy servants have loved thee exceedingly. 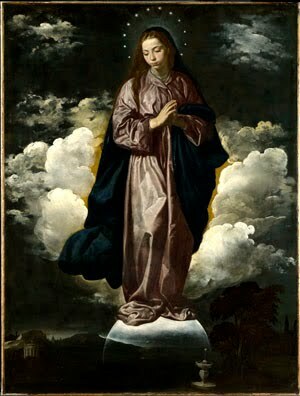 O God, Who by the Immaculate Conception of the Virgin, did prepare a worthy habitation for Thy Son: we beseech Thee, that as in view of the death of that Son, Thou didst preserve her from all stain of sin, so Thou wouldst enable us, being made pure by her intercession, to come unto Thee. Through the same Christ Our Lord. AMEN. 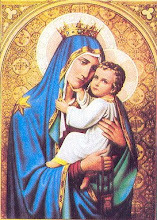 Today is the feast of the Miraculous Medal. The apparitions of Our Lady to Saint Catherine Labouré at the convent of the Daughters of Charity on the Rue de Bac in Paris are quite famous. Many people are unaware that the novice from Burgundy also experienced a vision of Christ the King, which foretold to her the July Revolution of 1830, and the final fall of the House of Bourbon. The July Revolution sent the Duchesse d'Angoulême and her family into permanent exile, as is told in the novel Madame Royale. Fr. Joseph Dirvin describes the vision of June 6, 1830 in detail in his biography of St. Catherine. The greatest of these clues is the nature of the French monarchy itself, which, as Hilaire Belloc understood so well, was a holy thing, wedded to the people it ruled, and the prototype of all the monarchies of Europe. This ancient royalty had its roots in Rome and had received its Christian mandate in the crowning of Charlemagne by the Pope on Christmas Day, 800 A.D. It had lived for more than a thousand years in one line of men. No matter how great the goodness or wickedness of these royal men—and there was an ample supply of both—the sanctity of the monarchy itself and its mystical espousal to the French people is not to be questioned. In its institutions, its duties, its relationship to those it governed, its elaborate ritual, it was an imitation on a much lower plane of the Church of God. The French, kings and subjects alike, knew this well. Jeanne d'Arc was in an agony until the Dauphin should be crowned at Rheims and his body anointed and consecrated in the sacred rite which was so essential to this kingly religion; in a sense, it was her sole mission, and it is significant that her fortunes declined afterward. Louis XI had the Ampulla of holy oil brought from Rheims that his dying eyes might rest on it. Napoleon III sought to sanctify his usurpation by having himself anointed with the small, hard lump that was all that remained of the holy oil in 1853. The Kings of France, no matter how absolute their rule, had to be born and to die, had to eat and drink, take their recreation, and pray in the sight of the people. 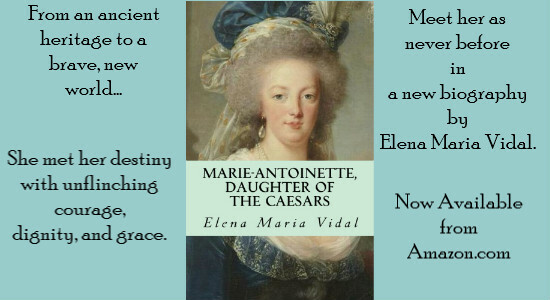 At the birth of her ill-fated Dauphin, Marie Antoinette almost died of suffocation, because of the press of the common people in her chamber, witnessing her lying-in; only the quick-witted action of a bystander, breaking a window to let in the fresh air, saved her. Certainly, however, Sister Laboure did not ponder thus in her heart. She knew only, as the common people know, that there was to be "a change in government," and that, as inevitably came to pass, "many miseries would follow." She knew only, as the common people know, that there had been too many changes of government in France over the last forty years, too many miseries following, and, with this instinctive knowledge of the people, she grew sad and feared. ~Pope Pius XI "Quas Primas"
While in Rome, my mother bought me a small statue of Saint Cecilia, the Roman martyr from the turn of the early third century. 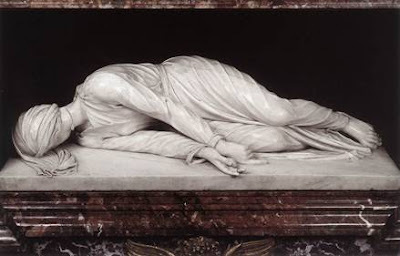 It is based on the life-size one in her basilica, sculpted after her incorrupt body was exhumed in the sixteenth century. She is lying on her side in her dressing gown with her neck half-severed. Cecilia was killed in her bathroom, and the executioner who hacked at her neck was put off by her calm dignity. It took her three days to die. The prelude to her ordeal was an attempt to scald her, which was why she was found near the bath - one of those huge Roman baths. For Cecilia belonged to one of the ancient Roman families and possessed great wealth. She was young, beautiful, and desired, but she died because she refused to renounce her Savior. 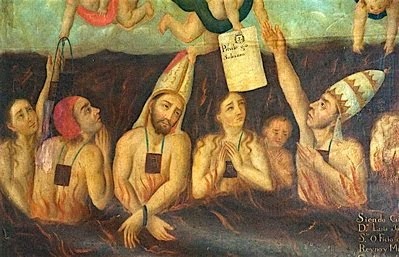 While journeying through life it is easy to understand why so many of the martyrs were very young. When people are young they do not understand what it is to lose life. Sacrifices are easier when you do not fully grasp what is being renounced. There is a special valor, a reckless courage, possessed by young soldiers which old soldiers do not always have. And yet Christians of every age are called to be soldiers of Christ and martyrs in spirit if not in body. The fortitude that seemed so effortless in my grandparents in their old age I see now was no small thing. The lesson will not be lost if we come to understand this much: had the first Christians feared, they would have betrayed us, and the word of life would never have come down to us; if we fear, we shall betray future generations, for we are expected to transmit to them the deposit we have received from our fathers. Those who had faith and courage, whether it was Saint Cecilia in her agony, or my grandmothers in their nursing homes, where they spent many years before they died, have passed on to me a priceless gift. Father Mark offers some history and thoughts to ponder on the feast commemorating Our Lady being taken to the Temple at the age of three by her parents. In the hidden recesses of the old Temple, the Holy Ghost prepares the new Temple, the all-holy Virgin, to become the Mother of God . Destined to be the living Temple of the Word, Mary dwells in the Temple of the Old Dispensation. She hears the chanting of the psalms, the prophets, and the Law. Was it there that the Most Holy Virgin learned Psalm 118, the long litany of loving surrender to the Word? And was it from Psalm 118, held in her heart from so tender an age, that she drew her response to the message of the Angel, “Be it done unto me according to Thy Word” (Luke 1:38)? There Mary smells the fragrance of incense and burnt offerings. There she observes the faithful of Israel streaming towards Zion, filling the Temple, seeking the Face of the Lord. 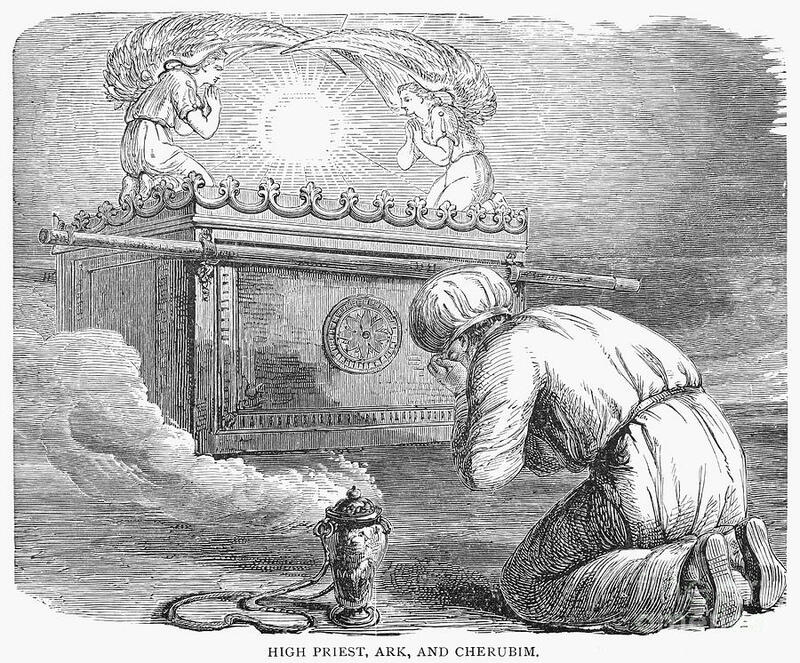 Priest, altar, and oblation are not unfamiliar to the Virgin who, gazing upon her Son, will recognize in Him the Eternal priest, the Altar of the New Covenant, the pure Victim, the holy Victim, the spotless Victim offered in unending sacrifice. In the seventeenth century — the age of France’s “mystical invasion” — the mystery of the Presentation of the Virgin in the Temple captivated the hearts of Monsieur Olier and of others on fire with zeal for the holiness of the priesthood, for the beauty of the consecrated life, and for the worthy praise of God. The so-called French School of spirituality, marked above all by the imperative of adoration and the virtue of religion, gravitated to the feast of November 21st as to the purest liturgical expression of the desire to be offered to God, to belong to God, and to abide in God’s house. 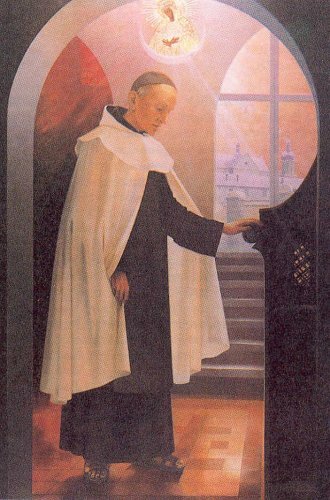 When, in 1641, Jean-Jacques Olier (1608 – 1657) established the seminary of Saint-Sulpice, he placed it under the patronage of the Virgin Mary in the mystery of her Presentation in the Temple. The Child Mary, hidden in the Temple, learns the meaning of sacrifice and oblation; she is the sacerdotal Virgin, prepared by the Holy Spirit to stand at the altar of the Cross united to her Son, High Priest and immolated Lamb. Under the influence of the French Sulpicians, many religious congregations, established after the horrors of the French revolution, chose the feast of the Presentation of the Virgin Mary as their foundation day, the day of religious profession, and of the renewal of vows. For Carmelite friars and nuns, it is of capital importance to honor the Most Blessed Virgin. And we love her if we endeavor to imitate her virtue, especially humility and recollection in prayer. Our gaze ought to be constantly turned to her, our affections directed to her, ever keeping in mind the remembrance of her benefits and trying always to be faithful to her. On November 17 the Church gives us the feast of Saint Elizabeth of Hungary (1207-1231) who in her twenty-four years on earth embodied virtues which in today's world have almost ceased to exist: honesty, modesty, courage, chastity, self-denial and fidelity. She was not queen of Hungary, as many people think, but a princess. Her parents were the king and queen. Being royal in those days meant that your life was not your own. Marriages between two ruling families would form an alliance between countries and keep two countries from going to war. So from her infancy, Elizabeth was a living pledge of peace, since she was promised in marriage to the heir of Thuringia. 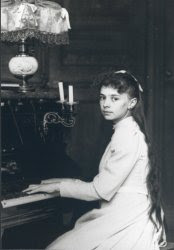 Elizabeth was sent to Germany at the age of four to be raised in the household of her betrothed, Louis of Thuringia, as was the practice of the time. It was heartbreaking for her parents to separate from their lively, dark-haired little girl, but they commended her to God and Our Lady. Louis' family disliked her, as was often the case with foreign royal brides, but he always cherished and protected his little fiancée. Elizabeth, although far from home, was a Magyar princess, and there was an intensity in her commitment to God and her husband which was repugnant to the placid Thuringians. They were married when Elisabeth was fourteen and Louis was about seventeen; he had inherited the dukedom of Thuringia from his father by then. Thuringia is roughly where Hesse-Darmstadt is now. In the thirteenth century it was a prosperous and powerful territory, although Louis was a duke, not a king. Elizabeth had always shown a strong inclination toward piety as well as a great love of helping the needy and downtrodden. She opened a hospital for the poor in one of her castles and ran a soup kitchen. She was passionately in love with her husband, which is one of her most appealing aspects - she was a saint but she was also very much a woman. Louis truly loved his wife and sought for a fervent priest to guide her spiritual life. Unfortunately, her later confessor, the overzealous Conrad of Marburg, was excessively harsh with Elizabeth. 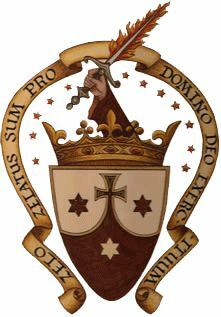 As Duchess, she established the Franciscan order in Thuringia and became herself a tertiary (with St. Louis of France, she is the patroness of tertiaries.) . Louis and Elizabeth had three children. When Elizabeth was twenty, her husband died while on crusade. She ran shrieking through the castle, as if she had lost her mind. Her brother-in-law coveted the inheritance; he evicted Elizabeth and her three small children from their home. He forbade everyone in Thuringia to give them shelter. The little family had to hide in a pig pen from the rain. Poverty, loss and persecution did not embitter Elizabeth, as it would have embittered others, especially when it involved the suffering of her small children. She accepted everything from the hand of God. Finally, someone got word to Elizabeth's father the King of Hungary, and he prevailed upon the Holy Roman Emperor to intervene. Elizabeth's lands were restored to her but she voluntarily chose holy poverty. After securing her children's welfare, she lived in a small room in the hospital she had founded and cared for the sick and the lepers. That would be like someone going to live with AIDS patients today. Emperor Frederick begged for Elizabeth's hand in marriage but she refused. She died at the age of twenty-four and as she passed from this world a great light filled the room. Many miraculous cures were reported at her grave site. She was buried wearing the imperial crown which she had refused in life. 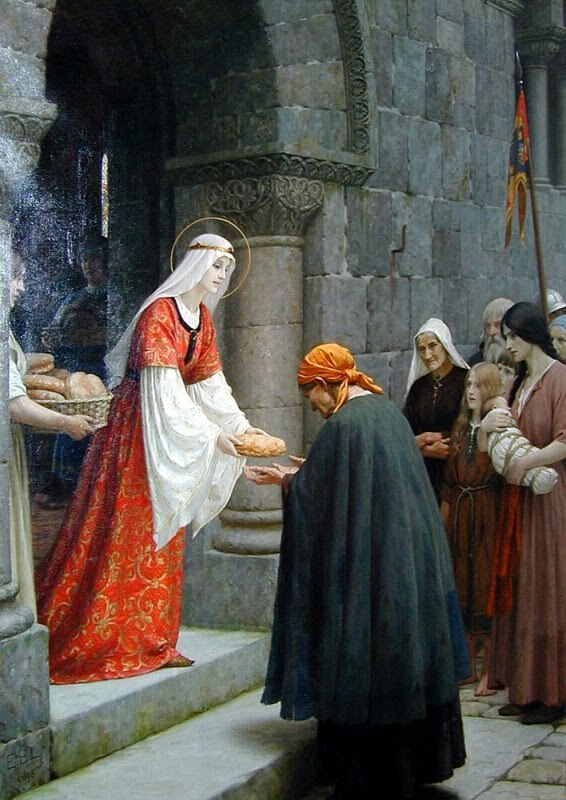 Thinking of St Elizabeth can help us when ever we feel afraid of poverty, or of being alone. Her spirit of humility and the renunciation of worldly honors can be imitated by all. Remembrance of the holy souls is self-forgetfulness. It is the cure . . . for them, and for us. Unless, God forbid, we go to hell, someday we will forget ourselves and remember the ultimate realities: God and our obligations toward one another. We can do it now or we can do it later. The souls in Purgatory would have us do it now. They remember us. Do we remember them? This is no time to sleep. Rest will come, but until now, we have not toiled for God nearly enough. The good men we have canonized at their funerals will not thank us for the kind and laudatory eulogies. We forget the sufferings of others so as to console our families, and ourselves and in this no one is served, not ourselves, not our families, and certainly not the souls of the departed. Oh, sweet sleep. How we crave rest, yet we will not find it unless we give it. During this November we would do well to do more than a casual visit to a cemetery or a write a check and conveniently hand it to our pastor for yearly masses, though both of these we should do. Indeed, nothing can be more efficacious than the Mass, except a Mass that is dedicated by the stipend of our own hearts. The apostles slept through Our Lord’s agony and we sleep through the agony of the poor souls. It is so easy to do. Perhaps we could offer time with Our Lord in the Blessed Sacrament, or more frequent communions for the grace to understand better the extremity of the situation and how the deliverance of the poor souls from their suffering will help protect us against our own peril, and how our imitation of their selfless desire for purity may save us from their present distress. "How awesome is this place! This is none other than the house of God and the gate of heaven." Today the Roman Catholic Church celebrates the feast of the Dedication of St John Lateran, also called the Basilica of the Savior. As the Pope's official church, it is known as the "Mother Church of the World." Every Christian is called to be a Temple of the Lord, a tabernacle for the Divine Indwelling. This feast celebrates the holiness of the house of God, of every church building consecrated to His glory, of every Christian who through baptism becomes a sanctuary of the Most High. We look beyond the scandals of this world to the Bride of Christ, coming down out of Heaven from God, to the nuptial banquet at the end of time, of which we have already partaken. For every church is a miniature heaven, and every Mass is the marriage supper of the Lamb. By making the dedication of the papal church a feast throughout the world, the Church intends to stress Catholic unity without detracting from the glories of lesser churches. Other churches also have feasts, and each diocese celebrates the anniversary of its cathedral's dedication. Every church consecrated with chrism and marked on its stone-work with twelve crosses has its anniversary. But today, all churches everywhere, even bare rooms in poor towns, or huts in tropical missionary lands, align themselves in prayer with the Church's church: "Grant that whosoever enters this temple to ask good things from thee may rejoice in the obtaining of all his petitions" (Collect). While we have one great High Priest, Jesus Christ, one Sacrifice in the holy Mass, one Faith, one Baptism, still it is for our convenience that in thousands of places we have God's temple, with thousands of human priests through whom Christ acts. 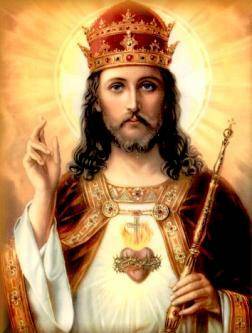 The underlying unity of the Catholic Church compares with Christ's seamless robe: it is a mark of true Christianity. For more than a thousand years successive popes ruled the true Church from their home near the Lateran basilica. Now, basilica means "house of a king," and you will recall that Pilate styled Jesus "King of the Jews" in mockery. Today the Lateran basilica is home of the King of Kings, and occasions a feast of praise. But the feast's special significance is that the Vicar of Christ the King maintains this church as his cathedral. The Pope lives now on the Vatican hill, near St. Peter's church, but he keeps the tradition of St. Sylvester: "This is that holy place in which the priest prays for the offenses and sins of the people" (Breviary). Hence churches have been usually consecrated by solemn rites and prayers, and it is a grievous sacrilege to profane them, or do in them anything but what has an immediate relation to the divine service: the church being the house of God. Though he be everywhere, he is said to reside particularly in heaven, because he there displays his presence by his glory and gifts. In like manner he honours the church with his special presence, being there in a particular manner ready to receive our public homages, listen to our petitions, and bestow on us his choicest graces.